T.G.I.F. ! It’s another Fabric Friday! 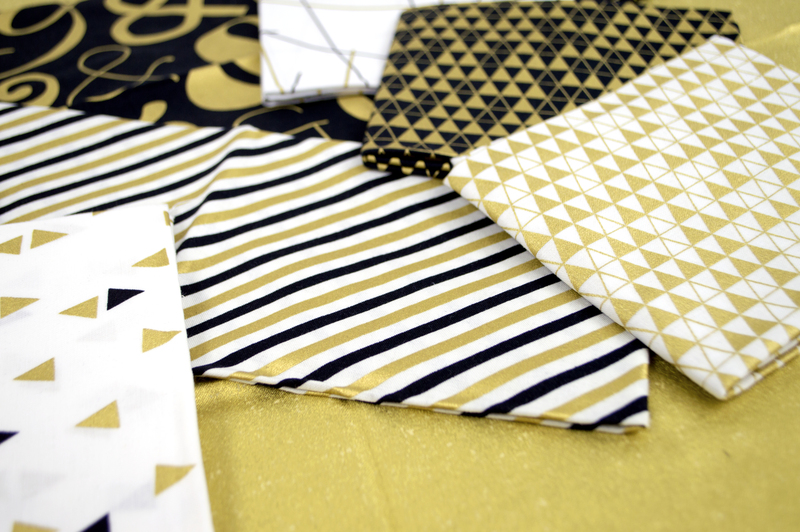 What better way to celebrate the upcoming weekend than with the festive and feisty Bold and Gold collection by Ampersand Design Studio? This feisty collection can help bring the party to any creation. With an eponymous gold ampersand main pattern and some versatile coordinating patterns, this tight group can make some sophisticated holiday throws and pillows or a quilt for a minimalist interior designer. We also thought this collection would make your presents sparkle! See below how we wrapped our gifts in it! Since it is Fabric Friday, you have a chance to win a bundle of this beautiful collection! Comment on this post by Monday, August 3, 2015. Let us know how you would use this Fat Quarter bundle and we’ll pick a lucky winner! Contest is over! BuncoBuddy is the lucky winner! Please email us back with your information! 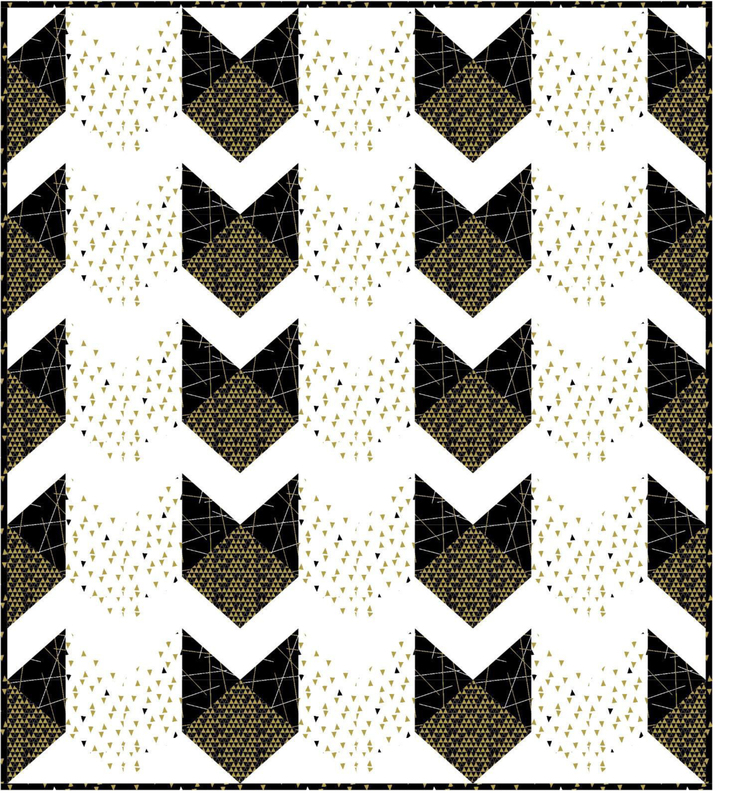 Be sure to also check out some of the free patterns that make use of this sophisticated collection, such as the chic and stylish Heading South quilt designed by the talented Kristy Daum, as pictured below. Patterns are available at the Windham Fabrics website. → Day One of the Lotta Jansdotter Blog Hop! Oooo, what great fabrics! It would make great accent pillows in my living room. Thanks! I would use this beautiful fabric to make throws and pillows to brighten my living room. I love this collection! It would be nice to make placemats and napkins. A table runner would be nice too. Tablerunner, bag or a quilt. Beautiful! I would make a table topper. Gorgeous fabrics!!! I can see a fantastic miniquilt! Love the Heading South quilt – very nice!!! Love the quilt and this fabric would make some classy table décor! I would make a lap quilt. I love fabric Fridays. Thank you for the projects that go along with the bundle. Thank you so much! I’m too lucky already. I just want to thank Windham for the gorgeous fat quarter bundle of FLORA that arrived today. Also thanks to Jennie of Clover and Violet that may have clued me into the contest. Kelly Ventura’s Flora is even lovelier in real life. Thanks again for giving me the opportunity and for sharing your beautiful fabric. 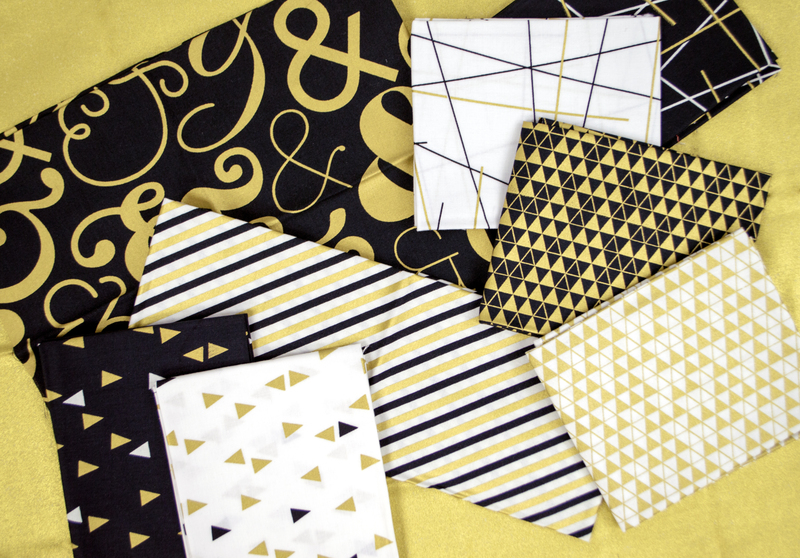 This week’s Bold and Gold and the Heading South Quilt pattern are a great pairing. HI, THIS WOULD MAKE A LOVELY DINNER TABLE RUNNER! THANKS! I think it would make beautiful pillows. Thanks for the giveaway. stunning, I would make a table runner for New Year’s Eve , or the heading south quilt as shown. Black and gold are so luxurious together. They are also the colors my daughter chose to decorate her loft apartment. With this bundle, I would make her a toss pillow and a matching table topper. I would add green and hot pink for a fun baby quilt. I think a pillow would be gorgeous in this fabric combo! Love this collection! Would like to use for tablet holder or bag. Gorgeous collection!! I would love to make some bags if I won! Thanks for the chance! I think these prints to the Halloween quilt I’m working on!! i love the way that quilt looks mocked up in these fabrics! i think this would make some fun patchwork pillows or a wall hanging. I would make a few One Hour Baskets to fill with goodies for friends and neighbors for the holidays! A fabulous throw pillow for my niece. ❤ She loves these colors. My sister loves gold! I would make a lap quilt for her in hopes that wrapping up in this quilt would make her feel special in a house with twin 6 yr olds. Gorgeous fabric! I would use the fabric to make that beautiful quilt Heading South. Probably need to buy more to make a full size quilt which I will gladly do. I love these! They will be perfect for the holidays for all kinds of decor! Fancy pillows are definitely in my list! I’d make a glamorous dress for my preschooler. I am in love with these prints. I would make an clutch to out to dinner or little purses to put all my bits and pieces in for my hand bag. So many ideas though because it’s just gorgeous. Attached misspelled email. The right one is attached to this comment. I would make an evening clutch or little purses to store all my bits and pieces in my handbag. So many ideas for this gorgeous fabric. What gorgeous fabrics! I think they’d make a striking and sophisticated tote. I would make a fancy table runner, for those special dinners! I would definitely make a tablerunner for special occasions. This collection is so chic! Wow!!! 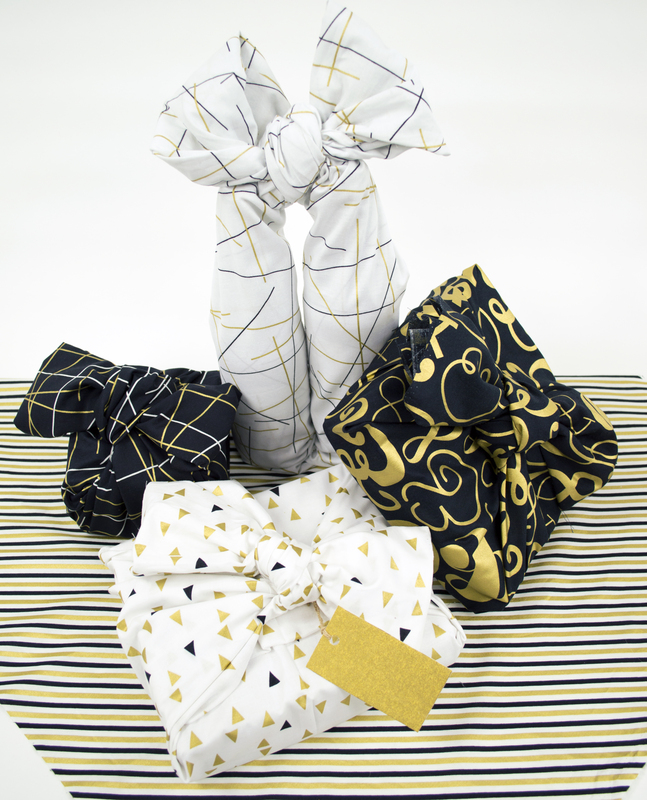 This gorgeous bundle of Bold and Gold would make such a great little clutch with some matching headbands and a little dresser runner to rest all of a Bold girls Golden little treasures…sewww lovely and sewww stylish. Such a wonderful giveaway! Thank you for the chance to own some✨ Bold and Gold✨. Lovely fabric. Looks as though I would make a table runner and place mats suitable for a dinner party! This fabric is just beautiful! I would use it for place mats and napkins to use at Christmas. Thanks! Beautiful fabrics! I would make the gift bag featured last Friday for “Happy New Year” gifts–all those gifts that didn’t get given in time for Christmas! Thank you for these giveaway opportunities! I would make tablerunners and decorative tableware for the holidays! i would love to make the heading south quilt for my sister-in-law. I would make bandana bibs for the oh so hip children on our block!! Love these colors!! I would make a variety of gift bags, incorporating all the beautifully coordinating fabrics. Love these classy fabrics. I would let them ‘take the lead’ in a black-n-gold quilt I’m planning for one of my sisters, in honor of the Iowa Hawkeyes. Bold and Gold speaks Clutches to me, carry one on New Years eve while all dressed up, to a holiday party. Runners and placemats on my dining table or party table. It’s just stunning . Thank you!